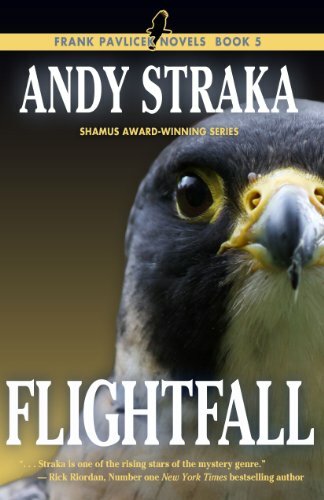 Continuing forging my way through Andy Straka’s Frank Pavlicek detective/falconry mysteries. Flightfall is a novella in which Frank and his daughter/partner Nicole get a call from their mysterious friend Jake Toronto. One of his falcons has been shot to death, and Jake believes it may have been an act of revenge. I think on consideration that my criticism of the previous book, which I reviewed last night, may actually have properly belonged to this one – it’s kind of over before it really gets started. But it’s nice to get to know Jake better, because he’s an interesting character. 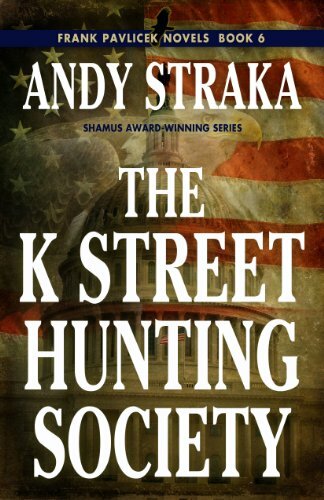 The K Street Hunting Society is a far better developed story. It also takes place in Washington DC, and there’s not a lot of falconry involved. Frankly, that’s OK with me. I have nothing against falconry, and I admire the tradition of the thing, but I don’t find it a terribly compelling plot device. This time out, Jake Toronto has hired Frank and Nicole to help him in a routine bodyguarding job in downtown Washington. But they come under attack by an assassin with an automatic weapon, and lose a client – and nearly lose one of their own. You just don’t do that to Frank, and you certainly don’t do it to Jake. They’re going to find the killer and even the score, whether the local police and the FBI want their help or not. I thought this was the strongest book in the series to date. As I’ve said before, the language is clean, the violence isn’t overdone, and the morality is generally good. Author Straka takes the opportunity to say a good word for the Christian faith now and then. I don’t care for Frank’s penchant for relying on hunches rather than deduction, but that’s personal taste. Enjoyable reading, highly recommended.